Free express shipping doesn’t need to be difficult. 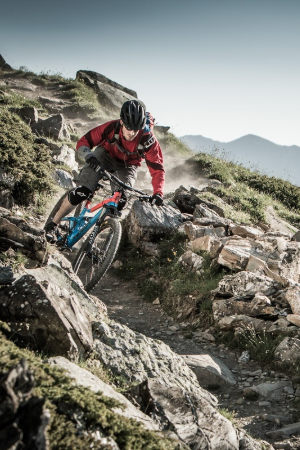 99 Bikes stocks over 900 styles of bikes from road bikes, mountain bikes to e-bikes, and they have managed to succeed at the seemingly impossible task of bike shipping. So before you ask: “is bike shipping even possible?”, this case study shows how 99 Bikes overcame the challenge of free shipping on bulky items, while managing to turn a profit from shipping, and increase their basket value and customer satisfaction. 99 Bikes ships large and bulky items all across Australia. They tested a few different shipping strategies to alleviate the cost of shipping cumbersome goods over long distances because they saw there was opportunity there to use shipping as a factor of differentiation. Below we go into more detail on these challenges. Many retailers offer free shipping for all their purchases, and in most cases this is a great strategy to attract and convert new customers, while also keeping existing customers happy. There is one issue for retailers offering free shipping on bulky goods though, and that’s due to order volume. Order volume is the one risk to retailers offering free shipping, because longer distances and heavy items can result in a shipping bill that can make your heart skip a beat or two. Another challenge is distance. If you’re shipping from Sydney to Perth, it can cost double the amount than shipping metro-to-metro. For example, standard Auspost rates on small parcels from Sydney -Sydney is $5.99, whereas Sydney – Perth costs $11.99, and that’s discounted weight and box size. With continual and unstoppable growth in eCommerce, courier services need to increase the rates they charge to keep up with the rising costs of doing business. Shipping rate increases also pose a sticky challenge for businesses that offer free shipping because retailers need to revise their product pricing strategies to maintain free shipping offers. There’s no beating around the bush – shipping large items is expensive and this can often result in a high rate of cart abandonment. In fact, 97% of generation Z shoppers abandon cart when they are dissatisfied with shipping costs. 99 Bikes is in a fortunate position that they have a lot of smaller items to offer their ‘I want it now’ customers, however, they needed a shipping strategy that could help them convert customers with large and bulky goods in their cart. 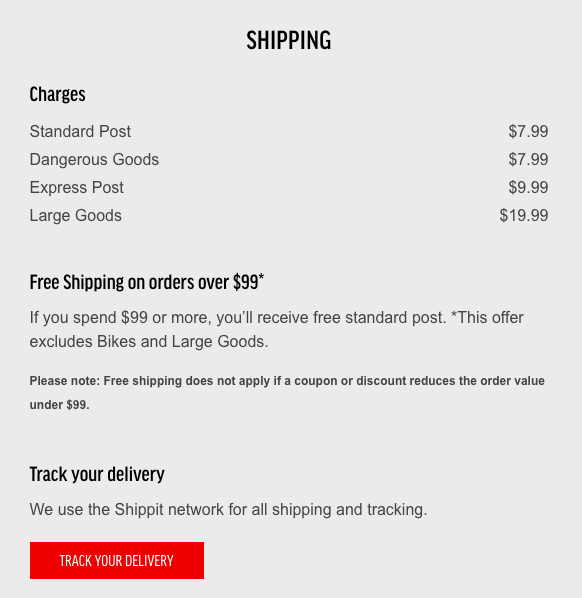 Originally, 99 Bikes started offering free shipping on all orders over $80. However, after they experienced an uplift in sales, they realised they can increase their free shipping threshold on orders over $99. 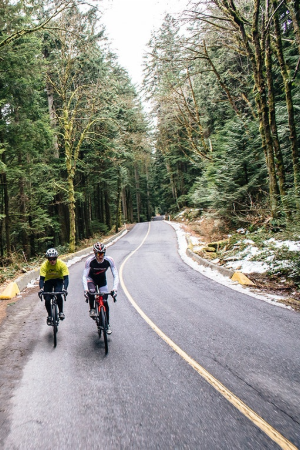 While this sounds like an expensive endeavour, 99 Bikes was able to demonstrate a more valuable proposition to their customers because free express shipping is always more appealing than none-free express shipping. 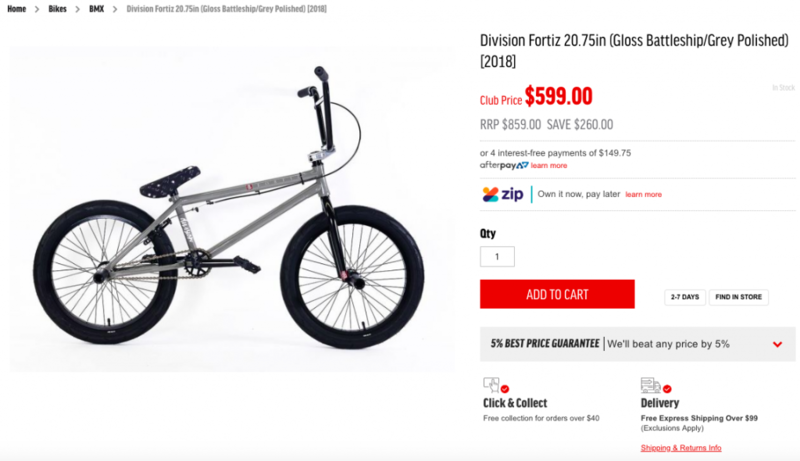 If a customer doesn’t want to spend $99 to get free express shipping, 99 Bikes has developed a clear set of flat rate shipping options for different items. 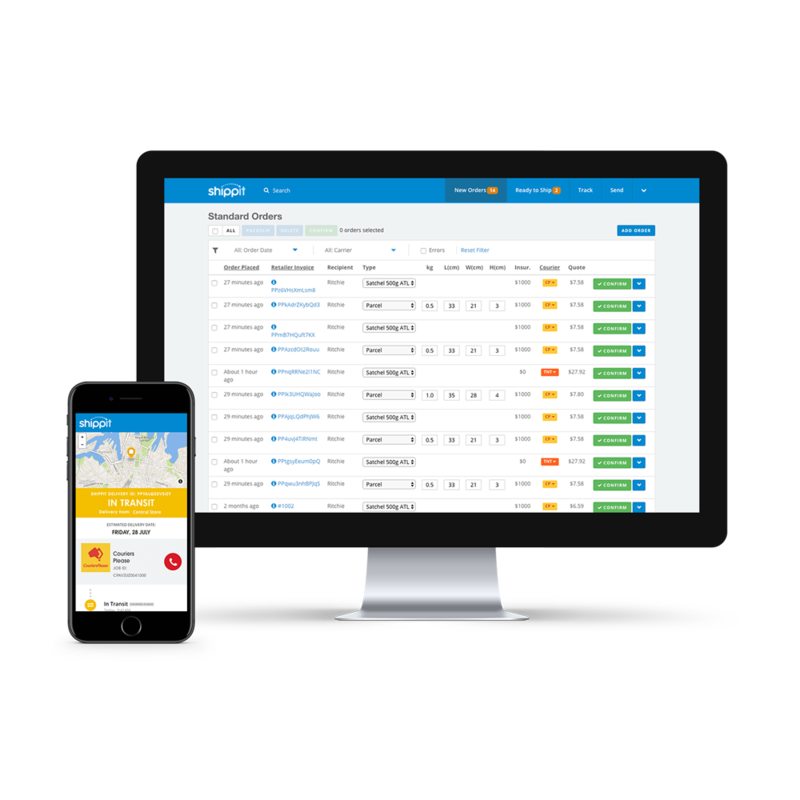 Offering customers flat rate shipping for orders that don’t exceed $99 removes all uncertainty and frustration of unexpected costs for shipments that need to travel long distances. Although we see that customers love free and flat rate shipping, there are always exceptions to the rule. Shipping bulky items is expensive because they take up a lot of room in courier vehicles, and that reduces the number of items they can deliver on that day. 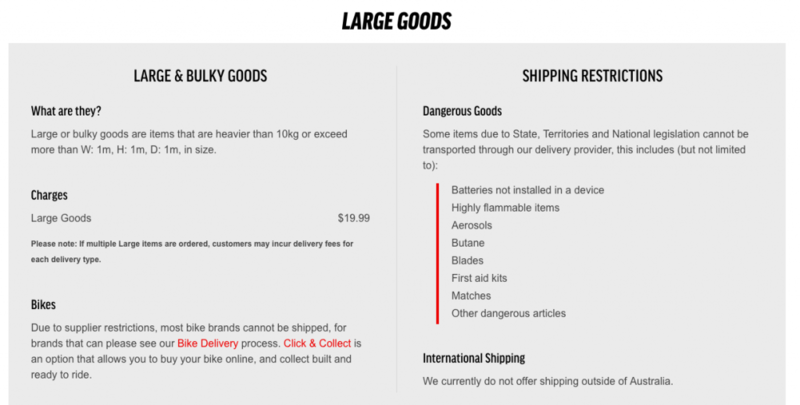 99 Bikes make it clear on their site that large and bulky items need to be treated differently to smaller items. 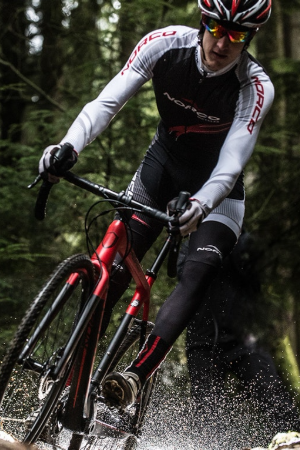 The 99 Bikes offer of free express shipping has demonstrated a unique value proposition for their customers. Offering free express shipping on orders over $99 is great incentive for customers to spend a little extra to get their items the next day at no extra cost. 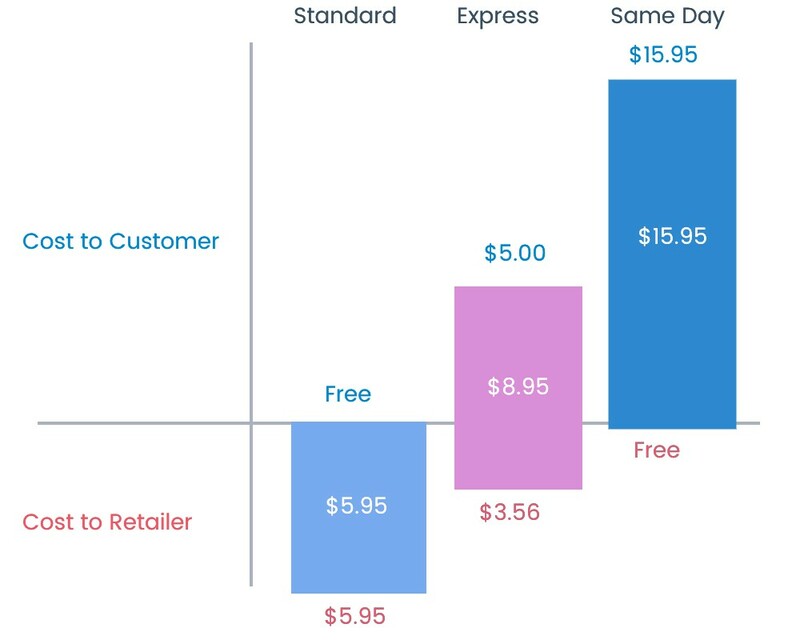 “It’s a behaviour we see customers do all the time, if they’re cart is $92, we can see them look through the site to get something small so they get free express shipping. There’s nothing worse than when a customer pays for express shipping and their items don’t arrive on time. We’ve all been there. We’ve seen the social media backlash that follows. Tom has been really impressed with how satisfied his customers have been, stating: “We can see from putting $99 free shipping in place that our reviews have improved and it’s increased our loyalty”. 99 Bikes were able to constantly renew their pricing strategy so they were able to get to ‘net neutral’ instead of a negative for shipping. Get in touch with our team to see how you can also start offering your customers free express shipping.